This site may contain other proprietary notices and copyright information, the terms of which must be observed and followed. Information on this site may contain technical inaccuracies or typographical errors. Information, including product pricing and availability, may be changed or updated without notice. Alyce n Maille reserves the right to refuse service, terminate accounts, and/or cancel orders in its discretion, including, without limitation, if Alyce n Maille believes that customer conduct violates applicable law or is harmful to the interests of Alyce n Maille. Alyce n Maille currently accepts Visa®, MasterCard®, Discover® and American Express® debit and credit cards through PayPal. Alyce n Maille reserves the right to change its payment procedures at any time without prior notice to you. If paying with PayPal, Alyce n Maille will ship to your PayPal address. Please make sure your address is up to date prior to purchase. Alyce n Maille charges sales tax for merchandise ordered on this Web site based on the applicable state sales tax rate and the location to which the order is being shipped. Florida residents must pay sales tax since Alyce n Maille is located in Florida. 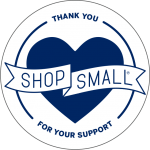 At this time, Alyce n Maille ships merchandise to select locations. The risk of loss and title for all merchandise ordered on this Web site pass to you when the merchandise is delivered to the shipping carrier. Alyce n Maille will ship to your PayPal address. Please make sure your address is up to date prior to purchase. Your beautiful items will be shipped within 5 to 7 business days upon receipt of payment unless it is a custom order. Customs VAT and import duties may be applied to International orders when the shipment reaches its destination. Such charges are the responsibility of the buyer and vary from country to country. Contact your local customs office for details. Shipping laws are different in each country. It is your responsibility to check with your Customs office to verify whether the country to which you are shipping permits the shipment of the items in your purchase. Alyce n Maille is not responsible for any direct, indirect, punitive, or consequential damages that arise from improper international shipping practices. It can take 4-6 weeks and sometimes longer for international shipping. Please take this into consideration prior to ordering. If you are unhappy for any reason with your purchase please contact Alyce n Maille immediately upon receipt of your item/s. I will do my best to work with you. Any item being returned must be unworn, unused, and in it’s original condition. Items must also be returned completely and in it’s original packaging. The buyer is responsible for any shipping charges which incur. Shipping fees are non-refundable. Metaphysical, holistic, and or healing properties and information on this site is not meant to replace the advice of your doctor. Should you have any medical conditions, please see a licensed medical practitioner. Alyce n Maille disclaims any and all liability from this information provided where the user assumes and is aware of any risk related to the believed healing properties of stones. Keep jewelry away from household cleaners and chlorine. To clean your jewelry, wash with a combination of water and non-lotion dishwashing soap gently rubbing your jewelry between your palms. Rinse with warm water and let air-dry. You may also dry it with a blow dryer set on the cool setting. Please DO NOT use jewelry cleaners, cremes, or polishing cloths on your jewelry. Please handle your jewelry with care. 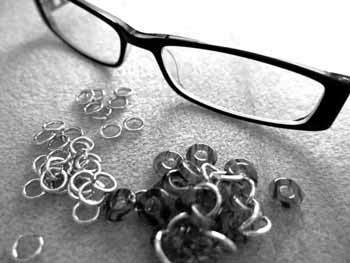 Chainmaille links are NOT soldered and therefore can be pulled apart. To prevent wear and tear and to extend the life of your gemstone bracelet follow the advice below. 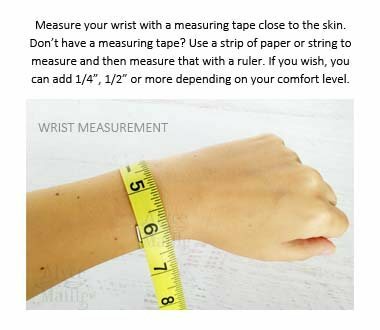 Measure with a flexible tape measure to get your wrist measurement. You can do this with a strip of paper or string if you need to, mark where the ends meet, and then measure between the marks on a normal ruler. 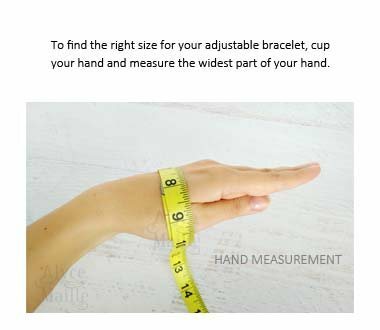 Take your wrist measurement and add about 3/4″ to 1 inch (depending upon how tight fitting you like your bracelets), this is your bracelet length. If you are unsure, just contact me and I will help you. Copyright © 2019 Alyce n Maille. All rights reserved. Please note, colors shown on your monitor may differ slightly than the actual item due to monitor color settings. PLEASE check wrist size before purchasing. Alterations after you have received an item can be done but at the expense of the buyer. If you have any questions or need help do not hesitate to ask. Although the information on this Web site is accessible worldwide, not all products or services discussed in this Web site are available to all persons or in all geographic locations or jurisdictions. Alyce n Maille reserves the right to limit the provision of their products or services to any person, geographic area, or jurisdiction they so desire and to limit the quantities of any products or services that they provide. Any offer for any product or service made in the materials on this Web site is void where prohibited. To fulfil your order, you must provide me with certain information (which you authorize to provide to me by purchasing from this site), such as your name, email address, phone number, postal address, payment information, and the details of the product that you’re ordering. You may also choose to provide me with additional personal information (for a custom order of jewelry, for example), if you contact me directly. Service providers. I engage certain trusted third parties to perform functions and provide services to my shop, such as delivery companies and payment processors (i.e. Paypal or Stripe). I will share your personal information with these third parties, but only to the extent necessary to perform these services. Your Rights: If you reside in certain territories, including the EU, you have a number of rights in relation to your personal information. While some of these rights apply generally, certain rights apply only in certain limited cases. I describe these rights below.